This is what is on my craft table today. 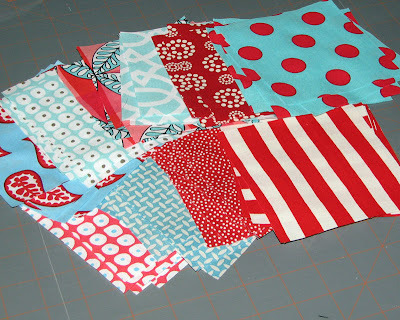 I have gathered some of my favorite red and Aqua fabrics, to join in the fun over at Jane's blog. 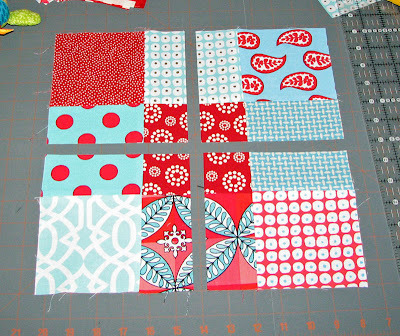 The challenge is 25 nine patch blocks done in only red and aqua's cut each into 4 and come out with a total of 100 blocks. Then they will be sent to Jane to mix up and send out randomly back to all of us. Now because this is a swap, I felt I could get a little more crazy with the fabrics I chose. I think was right to, they all look great together. I happen to know that a lot of you are beginner quilters, I thought I would set up a little tutorial for you to make your own. Even though it's a fairly easy block, when you are learning to quilt it makes it so much easier to see it done in real life. Right? We are making a disappearing nine patch block that will measure 12.5 x 12.5 when finished. 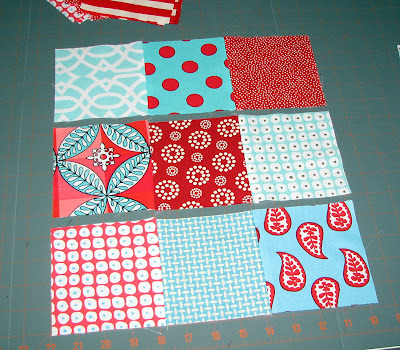 You will start by cutting 4.5 x 4.5 inch blocks from all of the lovely fabrics you have chosen. 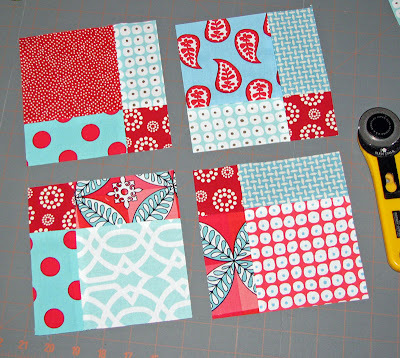 Choose the layout of your first block by picking out 9 of the 4.5 x 4.5 inch blocks that you have just cut. Align them 3 blocks by 3 blocks like you see in the picture below. I sew mine in rows, so the first row of three get sewn together with a 1/4 inch seam then I move on to the second row. After you have done all 3 rows sew the first row to the second, matching the seam lines. (makes it easier if you pin them in place). Then sew the first and second row piece to the third row piece. Now you should have a nine patch block 3 down and 3 across to make one square. I recommend an omnigrid 12.5x12.5 see through ruler to square up your block. Now to make the disappearing nine patch part. Take your nine patch block and cut it in fourths right down the middle. (see picture). This will make four separate quadrants. I found the easiest way to get the center was to measure 2 inches from the middle block, but you can find center however is easiest for you. You should now have 4 blocks that measure 6-1/4 x 6-1/4. 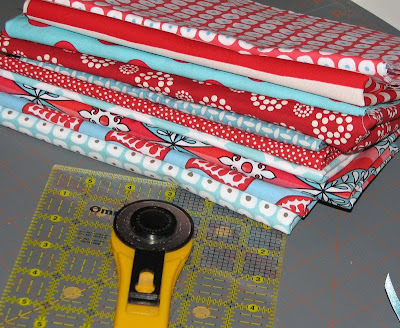 How many you need total, will depend on the size you desire for the finished quilt. To make more blocks continue the process over with step one again. The fun part about this quilt is you can re-arrange the blocks in almost any design you want to make it fit your taste. 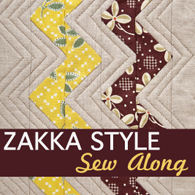 This is wonderful for beginning quilting, and easy to. If you are having problems with measurements I would suggest a 1/4 inch foot for your sewing machine. They come in metal and plastic to help you keep that 1/4 inch seam consistent. I do not recommend the plastic one as it bends and could give you an inconsistent block measurement over time. Here is a helpful website as well. I hope you all have fun making this quilt block, and please feel free to leave questions. I am here to help. Just make sure you leave an email if you would like a reply. Your fabrics look so good together! I can't wait to see how they all look! I really love that nine patch block pattern! WONDERFUL FABRICS! Red and turquoise are my favorite colors! If I had known about the swap I would've jumped at the chance to join. Great fabrics! I'm shopping for mine on Wednesday...can't wait! I called the shop and the owner said she has a great variety of reds and aquas so I'm hoping to find some fun fabrics to use. I finished aall of mine this weekend and I see we have a couple of the same fabrics. Isn't it a great color combination? Outstanding!! thank you for showing us how!! I adore your fabric!! Great job on your tutorial. I love this block because there are so many possibilities you can do with them... Thanks! Isn't the Disappearing 9 Patch a great block? Your colours are wonderful. I bet this will be a beauty when all is said and done. I finally know the secret to the disappearing 9-patch! How cool! Jane emailed me and I was able to join the swap. I am so excited. I see that you used 10 different fabrics. How much of each fabric did you use? I noticed that the centers of your block in the last photo were turned the wrong way. Just thought I'd mention. First of all, Anon, the layout of this design--has no set centers--it is the choice of the quilter how she wants them to go. 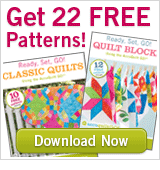 Second--this is a wonderful quilt, and your tutorial is great for beginners. A great way to discover how color, light/dark, and pattern play and make a great project. I find the DNP addictive!